You are here: Home / Austin Attractions / Can You Visit All Six Hawaiian Falls in One Day? 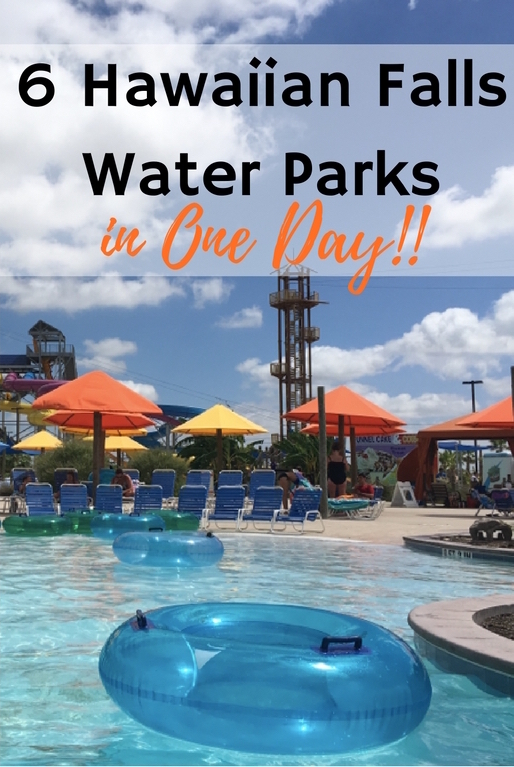 Can You Visit All Six Hawaiian Falls in One Day? As Hawaiian Falls season pass holders, my family is able to visit any of the six Hawaiian Falls water parks in Texas for free. But as Austinites, the 200-mile trek to the four Dallas/Fort Worth area parks has kept visits to those parks on our wish list. This year, however, we decided it was crazy not to take advantage of all the free fun awaiting us at all six Hawaiian Falls parks. So, we embarked on the ultimate summer road trip: one mom, four kids, six water parks in twelve hours. Starting with “The Original” Hawaiian Falls in Garland, just north of Dallas, we were off to the races! The kids jumped straight in the water and I had to fish them out to remind them we were on a mission. We only had 60 to 90 minutes to spend in each park if we were going to make it to all of them in one day, so we had to make sure to hit all of the major attractions. In the case of Garland, that meant Hawaiian Halfpipe! Kids loved: At Hawaiian Falls Garland, my three boys (ages 8, 10, and 14) couldn’t get enough of the half pipe. They paired up on the two-person tube and rode over and over again. They also enjoyed testing out the nine waterslides and the head-first racing slide, Pineapple Express. Season pass holders can enter the water park half an hour early, so the boys took advantage of the fact that there were no lines at 10 a.m. My daughter (age 3) isn’t tall enough for the big slides, but she was thrilled that she could stand in the lazy river, so we floated in circles while the boys played. Mom loved: I enjoyed that the water park was tucked into small hills, making it a scenic spot to spend the morning. There was plenty to do for all ages, and I wish we could have stayed longer to enjoy the two pools and water playscape, Keiki Kove. At Hawaiian Falls The Colony, we were spoiled with a private bungalow by the lazy river. The kids were so impressed that it came fully stocked with drinks and snacks (not to mention a television with Netflix and YouTube) that I had to kick them out to go try the slides. And then, of course, my three-year-old and I stayed behind to eat snacks in peace! Mom loved: I was a huge fan of the water walkway pictured below. It is brilliant to have a water highway that connects attractions, so guests can navigate the park without scalding their feet! Hawaiian Falls Roanoke, located northwest of Fort Worth, blew us away. When the park opened in 2011, its Mega Waterworld, pictured below, was the largest water play structure in the world. It’s still the largest in America, with 12 slides attached, including a three-lane racer, body slides, and the green Hawaiian Halfpipe family raft ride pictured above. Kids loved: Hawaiian Falls Roanoake had so many unique attractions, from the Tsunami Soaker, an Angry Birds-style water balloon launcher, to the Beach Blasters racing tube ride pictured below. The kids were sad to leave this park; it would be a great place to spend an entire day! Mom loved: Another water walkway, plus a fun lazy river with animal sculptures that spit water at us as we passed by. I also loved watching all of my kids have an epic water ballon battle, compliments of the Tsunami Soaker. Plus, the park’s fresh squeezed lemonade is to die for. Hey look, another Keiki Kove! Many of the attractions at different parks have the same names, but unique designs. They’re all a little different, giving each park its own distinct personality. Hawaiian Falls Mansfield, located south of Fort Worth, gets my vote for best landscaping, but it’s also one of the best parks to visit if you’re taking a wide range of ages. There are tons of options for the preschool set, and the park also boasts the most slides of any Hawaiian Falls water park. In terms of water park square footage, Mansfield wins as the largest park! Kids like: Mansfield is the only park that has a three-person tube ride, Cliffhanger, which worked out great for my three boys! Mom likes: There are so many options for little kids: a water play structure (Keiki Kove), an activity pool (Splashwater Reef), a splash pad, a wave pool with water features in the shallow end (Waikiki Beach), and a lazy river (Kona Kooler). This is another park where I would love to return for a whole day of fun. We arrived at the Waco park at dinner time, and for the first time all day my three-year-old went down a water slide! And then again, and again, and again. I realized that this water play area didn’t have one of the giant, 1000-gallon water-dumping buckets, like the other Keiki Koves. So, this low-key activity pool was just her speed. The boys went off in search of more exhilarating rides, like the Pineapple Express mat racer and Tempest Tower’s Monsoon and Typhoon body slides. Kids like: My 14-year-old said he loves Hawaiian Falls Waco because it’s so beautiful, with all the big trees. I think that’s why we all like it. The environment is so relaxing and laid-back, it almost feels more like spending a day at a resort. Mom likes: The lazy river! All Hawaiian Falls parks have a lazy river, but Waco’s Kona Kooler borders the park and offers scenic views of the trees of the Brazos River Valley. Okay, I’m cheating here with the photos. We arrived at Hawaiian Falls Pflugerville at 9:10 p.m., just in time for the Friday Palooza fireworks at 9:30. It was dark and all of my photos are of the night sky filled with fireworks. But what you really want to see is the attractions, right? So, these are my photos from another visit. We started with the oldest Hawaiian Falls and ended with the newest! Hawaiian Falls Pflugerville, now in its third season, is the only location to have both a water park and adventure park. In addition to the park’s wave pool, activity pool, lazy river and water slides, families can also enjoy a ropes challenge course, rock climbing wall, free fall, and zip lines. Kids like: The Adventure Park! My boys tackle the ropes challenge course at least once every time we visit. You have to be dry (and wearing closed toe shoes – don’t forget those), so they either try it first thing or at the end of the day. Mom likes: This is our home park, so I feel very comfortable letting my big kids go off on their own while I float around the lazy river with my toddler. I love that nearly the whole park is visible no matter where you are, so it’s always easy to track down kids when I need to find them. Drive time home: Well, I imagine that depends on where you live. But once you get there, you’ll sleep well after a day at Hawaiian Falls! Disclosure: Heidi and her family were invited to try all six Hawaiian Falls in one day. She was not compensated for this article. All opinions are her own. Wow! this looks awesome! I have never grown out of my love of waterslides and this seems like the motherload. What a fun-filled day! I bet everyone was pretty exhausted afterwards – and happy.